Cedar oil is an essential oil derived from conifer trees (trees that bear cones and needle-like leaves) of the pine or cypress families. It has many applications including medical and industrial uses, but is also commonly used in perfumes, aromatherapy and in pest control. Turpentine is derived from the resins of live conifer trees. It has anti-bacterial and anti-fungal properties and is considered safe enough by the FDA (Food & Drug Admin) to be used as a food preservative. The ancient Egyptians even used it in their embalming practices because it kept away insects. What Do Cedar Oils Do? Cedar oil controls different insects in different ways. It is known to be toxic to fleas, ticks and mosquitoes specifically, which are the common pests we'd love to get rid of. However, many a pesky insect beyond ticks are turned away by the natural effluvium of cedar. Another perk is that it's completely non-toxic to humans and pets and for me, has a woodsy aroma that I've come to consider a sign of summer. 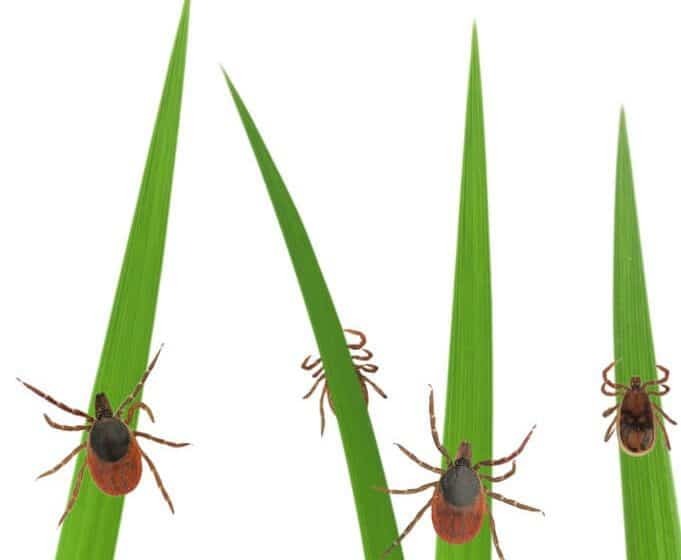 How Do I Use Cedar Oil as a Natural Tick Repellent? There are a number of ways to deploy cedar oil spray to protect your yard from insects. We live in an area that is completely infested with ticks and mosquitoes and I've tried many methods to reduce them. I've settled on a set of strategies that includes elements of landscape design, tick tubes and spraying. Until we added this oil to our arsenal, everything else seemed only modestly effective. This is just my personal assessment, but I think it was the single largest factor in our ability to control the ticks. Before we started using it there were many tick bites, now it's extremely rare that anyone gets bitten in our yard. We use it in mainly two (2) ways: as a lawn/yard treatment and sprayed directly on our clothing and/or bodies. There are a few common ways to use cedar for killing and repelling ticks and other insects. You can buy cedar mulch or pellets that you spread on your yard, which is a fairly durable solution that doesn't need to be repeated that often. That solution works for various bugs but it is NOT intended to repel or kill ticks specifically, and it says so on the bag. As stated previously, the main method we use is spraying. Every two weeks or so we spray the entire yard where the kids play and the surrounding areas and structures, from the ground up to about 5 feet high on any structures. 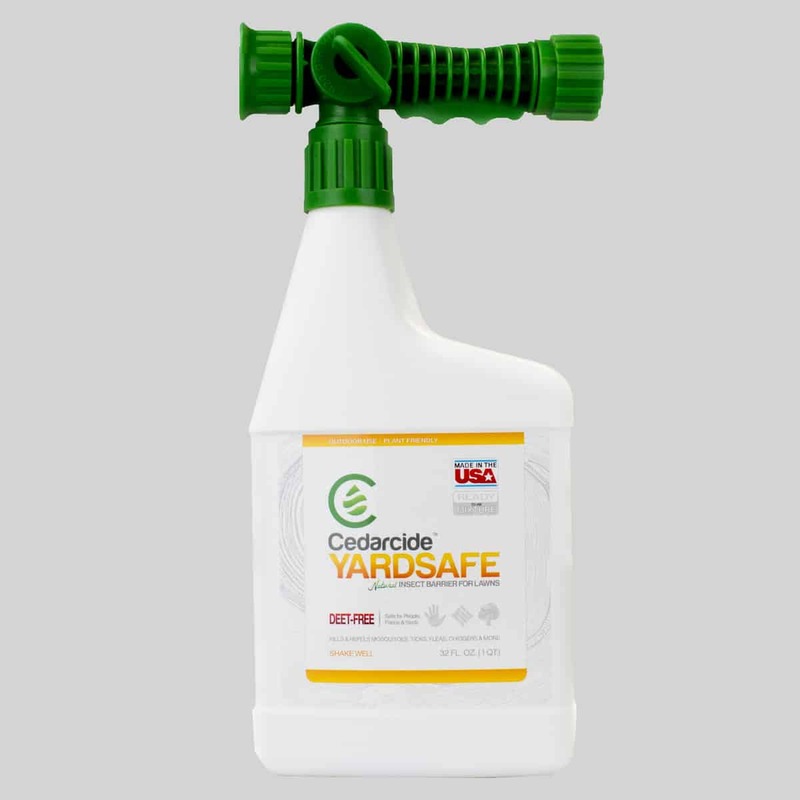 CedarCide even makes a sprayer bottle called YardSafe that requires no adjustments at all to get the right concentration. This product is a natural tick repellent for yard use specifically. I use this one when doing extra treatments for ticks only (as opposed to mosquitoes and other bugs, though it repels/kills them too). However, it's been a while since I bought YardSafe because it's only slightly less convenient and cheaper to buy PCO Choice. If you're using it for fleas and ticks it's still a bit cheaper, and if you move up to the next size (6 quarts) it becomes substantially cheaper again on a square foot coverage basis. 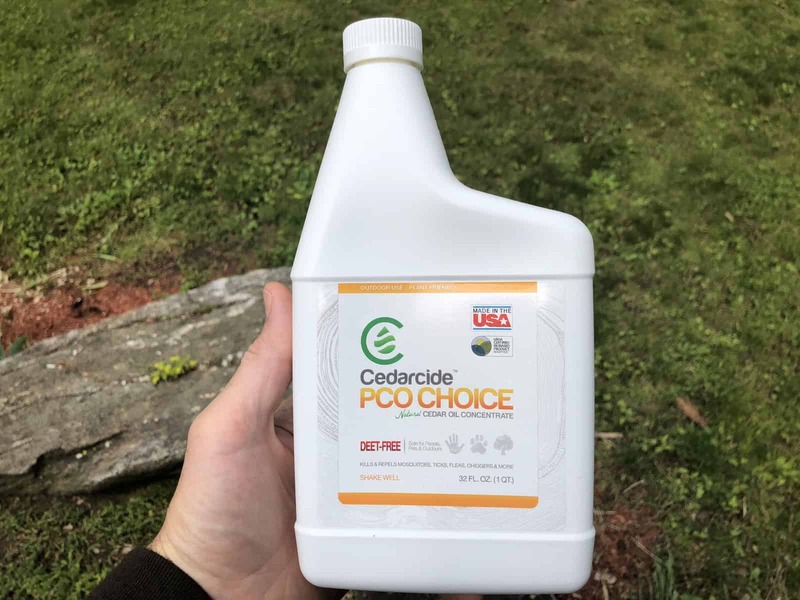 A quart of PCO Choice comes with a hose-end sprayer with directions on the side that are specific to Cedarcide. 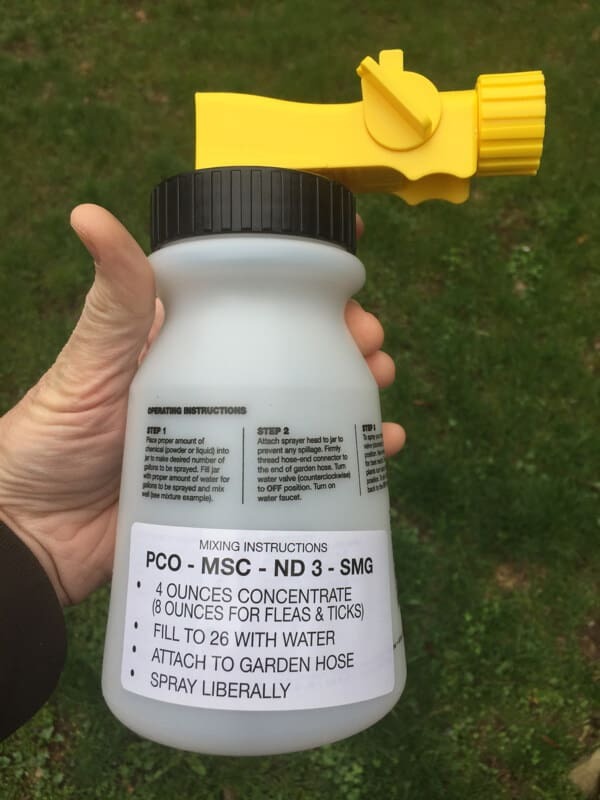 I spray a broader area when treating for other insects like mosquitoes and I add gar﻿lic oil for that because it's a relatively inexpensive addition and mosquitoes hate it. The hose end sprayer has a good capacity and you can use it for any spraying needs, so it beats buying a similar sprayer for $10-$20. I typically do the entire yard spraying with garlic oil mixed in as well for extra mosquito repellent. I combine with the Cedarcide and do it all at once using the hose-end sprayer you see below. Works great. It is possible to buy clothing that is pre-treated with permethrin. Permethrin has a low mammalian toxicity but it is a synthetic toxin nonetheless, and the warnings on the bottle look very different than what you see below. 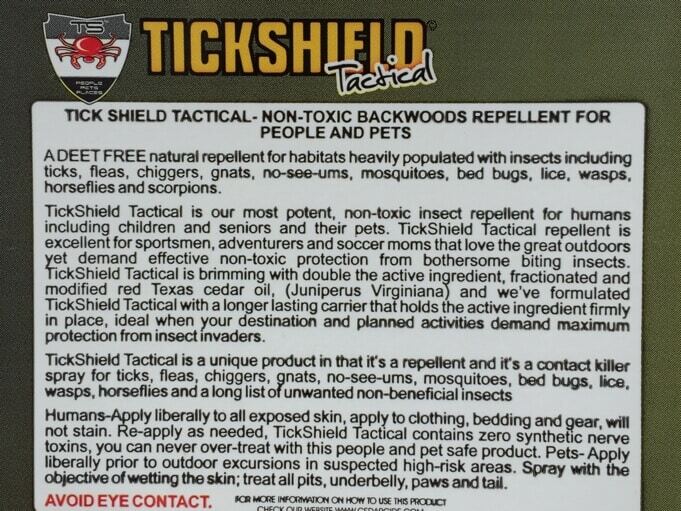 Instead of buying dedicated, toxic clothes, we prefer to just spray our clothes with Tickshield Tactical. You can get it via Prime from Amazon here, but it only comes in a gallon container, which is fine by me because we use a lot of it. Below is the full product description from the back of the bottle. There's not much in it actually. In terms of active ingredients, it's just cedarwood oil. And inactive ingredients? Just hydrated silica. That's it. 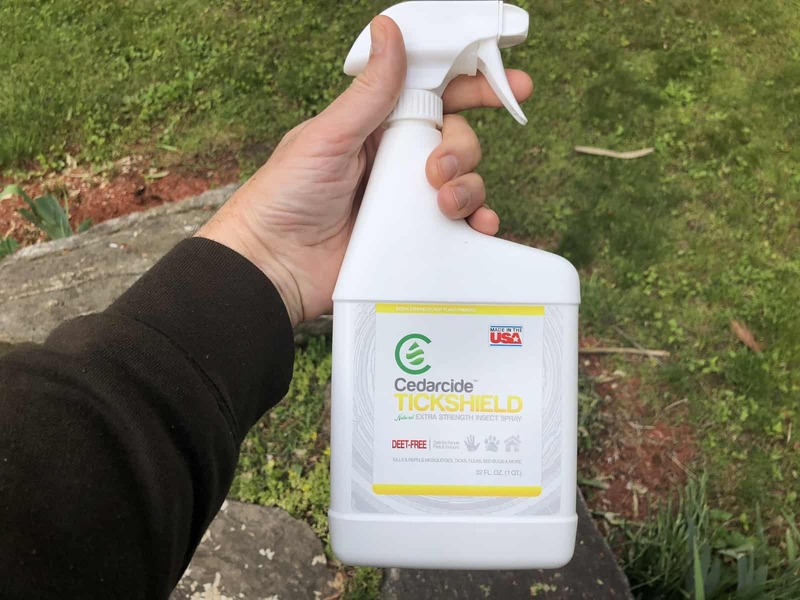 CedarCide sells personal size spray bottles but we usually buy the quart-sized containers above, which are great for spraying down clothing. We also pour it into smaller spray bottles like the homemade version below, which are perfect for cars, purses, etc. We keep a number of them throughout the house. Before going out into the yard we spray down all our clothing and, to a lesser extent, our skin with the Tick Shield. Do this outside because while it doesn't smell bad, you don't necessarily want your house to smell that woodsy. We'll repeat that process every few hours if we're out for a long time. Where Can I Buy Cedar Oil? If you want to know where to purchase cedar oil and/or want to see the complete line of products, head over to the CedarCide site. They have a wide array of products, from products for humans like we're discussing here to products for cats, dogs, livestock and even household products like detergents and cleaners. You can also dip your toe in the water with a tiny personal bottle or go whole hog and buy gallon jugs to dowse your whole property. For more information on buying cedarwood essential oil, see our article on where to buy essential oils. 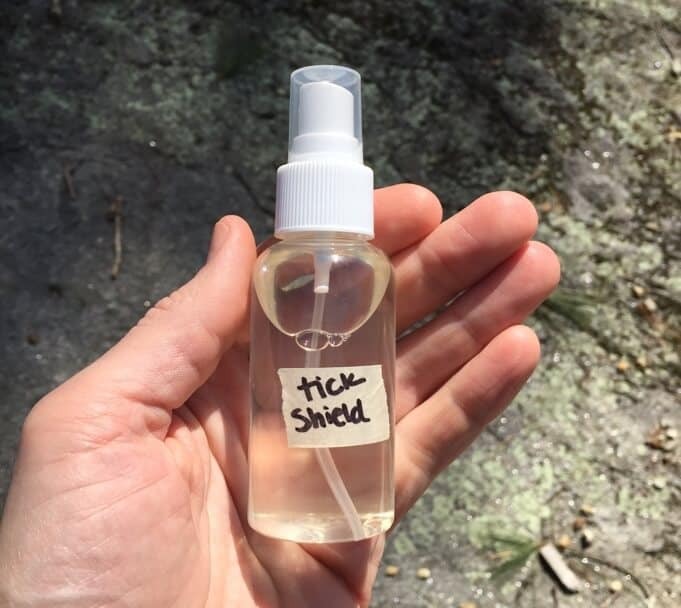 Need an effective tick repellent? How Does Cedar Oil Work? Cedarwood essential oil isn’t just harmless, it’s actually highly beneficial to humans when applied externally. It has been recommended by Dr. Mercola, Dr. Axe and many other natural health gurus. It has numerous health benefits and can be used to treat various ailments. Acting as an excellent natural insect repellent is only one of the multi-uses of this remarkable oil. When used as an essential oil for natural health purposes, it's usually referred to as cedar wood oil or cedar wood essential oil. Pregnant women should avoid using cedarwood oil unless okayed first by their doctor. Skin irritations have been reported when used in high concentrations. It is highly potent and if ingested can cause nausea, vomiting, thirst, and cause extensive damage to the digestive system. Don’t ingest it! Spraying cedar oil on the lawn is effective against all kinds of insects and does a great job of making your yard a more comfortable place to relax. Even rodents don't like to be around cedar, which is why we still use permethrin in the tick tubes (mice transport the permethrin in that case). 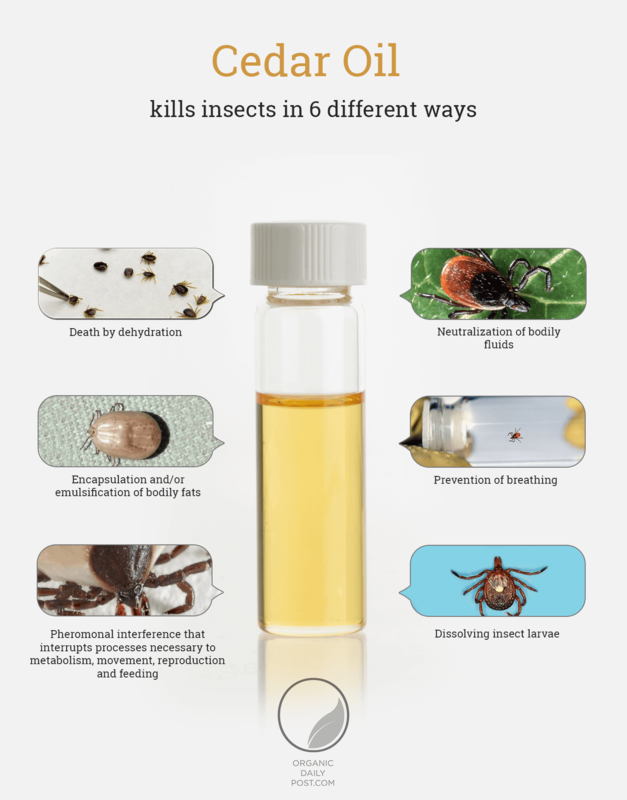 Having tried a number of different options, we've been very satisfied with this oil as an effective natural tick killer and for general insect control. Give it a try and enjoy your summer! Q: What insects does cedar oil kill? I've also personally noticed that using cedar oil repels most flying insects. Certain large pests like horse flies seem to be less repelled by it than smaller flies, but it's a potent repellent of most insects. Q: Is cedar oil a pesticide (kills on contact) or a repellent? A: Both. In its liquid form is a contact killer of most insects. Once it has dried, it becomes a potent natural repellent. Q: Are cedar oil and cedarwood oil the same? A: Yes. Cedarwood oil is typically used to describe the essential oil for use in aromatherapy and home remedies used on humans whereas cedar oil typically describes the oil used as a pesticide. But they are the same oil, derived from the same trees. Q: Does cedar oil kill beneficial insects like bees? A: No. The ability to kill many pests without harming bees an other beneficial insects is THE key property of it, and the one that makes it superior to chemical pesticides in my opinion. Q: What does cedar oil smell like? A: As you'd imagine, it smells like cedar. Ever smell a cedar box or a closet made of cedar? It's like that only more potent. Q: What species of cedar is used to make cedar oil? A: Cedarcide uses Texas cedar (Juniperus ashei).